Ebola outbreak. China economic slowdown. Hong Kong protests. Russia/Ukraine conflict. U.S. military strikes in Iraq and Syria. Europe in recession. The Fed potentially ending QE. There is no shortage of concerns regarding the global economy. Given those headlines, it’s about time we had the proverbial healthy 10% correction in stocks, and we already have. From the highs of the third quarter to their lows last week, the S&P 500 and Russell 1000 large cap indices were down 10%. MSCI World Index was down 11%. The MSCI Emerging Markets Index was down 12%. The Russell 2000 Small Cap Index was down even more, 14%. It has been a hectic market in the last several weeks. Despite the recent spike in volatility, month to date, both Crescat hedge funds are up by almost 1% while Crescat Large Cap is down less than 1%. All three strategies are ahead of their benchmarks. Returns through September are shown in the table and chart below. We welcome volatility returning to the markets. Global central banks are poised to keep interest rates suppressed for a long time. This makes equities a highly attractive asset class relative to fixed income. The median Crescat long equity holding in our portfolios has a trailing free cash flow yield of 7.2% and an expected 3-year FCF growth rate of 11.9%. This compares to a 2.2% yield on the 10-year U.S. Treasury, a security which offers almost no yield and no growth. The peak of the reporting season is happening this week and next, ending the quiet period for company stock repurchases. The broad stock market decline could stimulate corporate share repurchases in November. Buybacks return capital to shareholders, boost per share growth rates, and provide support to falling share prices. In the last seven years, November accounted for about 14 percent of the yearly buyback activity, the most of any single month. Perhaps the biggest reason of all to be bullish on stocks and the global economy, however, is the recent drop in oil prices, which we have been predicting as part of our New Oil and Gas Resources theme. This drop appears to be sustainable as we discuss below. Brent, the world’s most active crude contract, is more than 20 percent below its average for the past three years. This equates to a global stimulus of more than $1 trillion. In fact, the recent deflation in oil and other commodities has caused St. Louis Fed President James Bullard to strongly lobby the FOMC to extend, rather than end, QE at its meeting next week. Our New Oil and Gas Resources theme has been contributing measurably to returns recently. We blew the whistle on the oil and gas Master Limited Partnerships (MLP) bubble in our last quarterly letter. We believe that the MLP structure is reliant on capital inflows from new investors to support distributions to unit holders on underlying businesses that generally do not generate any free cash flow to support dividends. The structure allows for unsustainably high distributions to be paid and requires substantial new equity and debt offerings to maintain those distributions. With oil prices now falling, we see more trouble ahead for oil and gas MLPs. We have been short both WTI and Brent crude oil. Also, we have been short a carefully selected basket of MLPs and Exploration and Production (E&P) companies. These have been very successful trades for us in Q3 and the beginning of Q4 2014. Downward price pressure on crude is coming both from excess supply and moderating demand. The US and other non-OPEC countries have continued to increase production. Ongoing unrest in the Middle East has not translated into supply disruptions that have occurred in the past. On the demand side, the developed economies continue to recover slowly from the Global Financial Crisis. Developing countries, most notably China, have seen their high growth deteriorate. Recent discord among OPEC members suggests that the cartel might not decrease production to support prices as it has in the past. Thanks to the recent correction in oil prices, consumers are left with more money to spend and many companies, outside of the energy sector, will benefit from this global stimulus. We believe that the shale boom in the US is far from over. Marginal producers will feel pain, as high levels of domestic production will keep WTI crude priced in the low to mid $80s range. The bigger result of this drop will be seen in the coming months as consumers increase spending. Such dynamic moves in the market require identifying macroeconomic themes and active portfolio management to capitalize on constantly changing environments. Crescat is committed to creating value by identifying and capitalizing on macroeconomic trends, no matter which direction the market is headed. 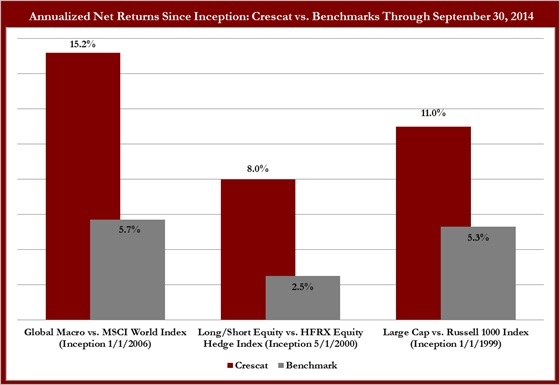 Crescat strategies have performed well over the long term through booms and busts, surpassing their benchmarks by a large margin. We believe some our best investment performance lies ahead. As always, thank you for the confidence that you have placed in us. Crescat Portfolio Management LLC is an asset management firm headquartered in Denver, Colorado. The firm claims compliance with the Global Investment Performance Standards (GIPS®). Investors and prospective investors can access the latest GIPS compliant performance presentations in the links directly below or by contacting info@crescat.net or (303) 271-9997. Crescat Capital manages private investment accounts for institutions and high net worth individuals through its wholly owned subsidiary, Crescat Portfolio Management LLC, an investment adviser registered with the U.S. Securities and Exchange Commission. Reported returns are purely historical, no indication of future performance, and may be adjusted subsequent to third party accounting verification and audit. The information contained herein does not constitute an offer to sell nor the solicitation of an offer to buy interests in any fund. Such an offering is made solely by means of a fund private placement memorandum as presented by a fund principal. The information contained herein is being sent to clients, prospective clients, and others who have requested it. It is not being distributed publicly, is confidential, and is not to be redistributed to any other persons without the prior permission of Crescat Capital. Only qualified investors will be admitted as limited partners to a Crescat fund.